Loaded! 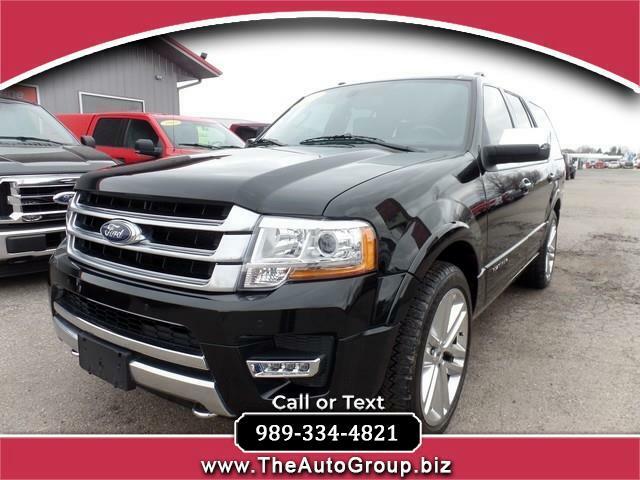 A must-see, must-drive, our luxurious and capable 2015 Ford Expedition Platinum 4WD is presented in stunning Tuxedo Black! Powered by a TurboCharged 3.5 Liter EcoBoost V6 that offers 365hp while paired with a 6 Speed Automatic transmission with Manual-shift capability. This Four Wheel Drive can attain near 22mpg on the highway and tow up to 9,200 pounds while showing off premium 22-inch wheels. Once inside this Platinum, love heated and cooled leather seats, a power sunroof, ample storage, and power options for all of your devices. Maintain a seamless connection thanks to the MyFord Touch interface with a touchscreen, a premium Sony audio system with satellite radio and voice-activated navigation. You ll appreciate the versatility of a split second-row seat and a fold-flat third-row seat. Rear parking sensors, keyless entry, and dual-zone automatic climate control are also convenient. This Ford is equipped with advanced safety features such as front and rear parking sensors, blind-spot monitor, SOS post-crash alert and MyKey, our Expedition boasts exemplary safety ratings. With the comfort and capability to carry your entire crew safely and in absolute style, this handsome SUV is the ideal choice! Print this page and call us Now... We Know You Will Enjoy Your Test Drive Towards Ownership!